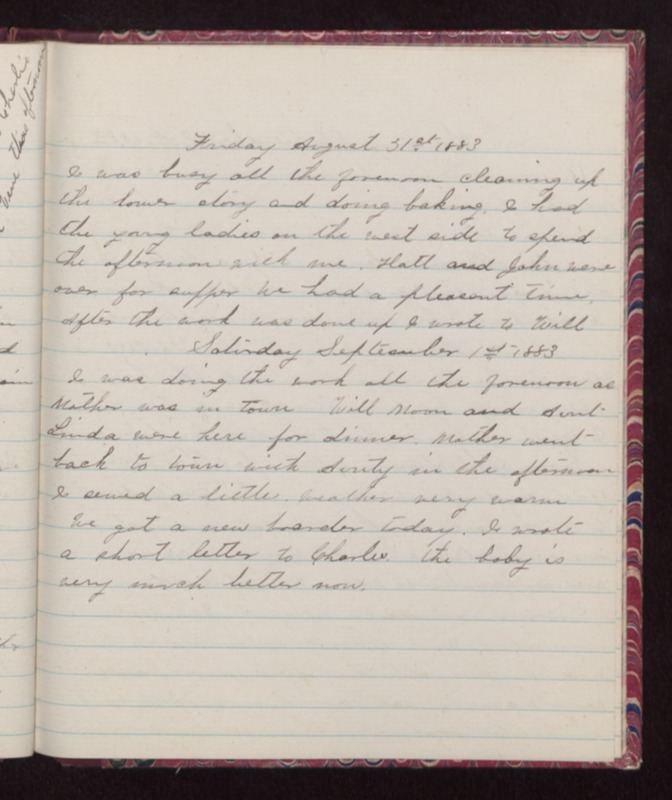 Friday August 31st 1883 I was busy all the forenoon cleaning up the lower story and doing baking. I had the young ladies on the west side to spend the afternoon with me. Hatt and John were over for supper We had a pleasant time. After the work was done up I went to Will. Saturday September 1st 1883 I was doing the work all the forenoon as Mother was in town Will Moon and Aunt Linda were here for dinner. Mother went back to town with Aunty in the afternoon. I sewed a little. Weather very warm. We got a new boarder today. I wrote a short letter to Charles. the baby is very much better now.